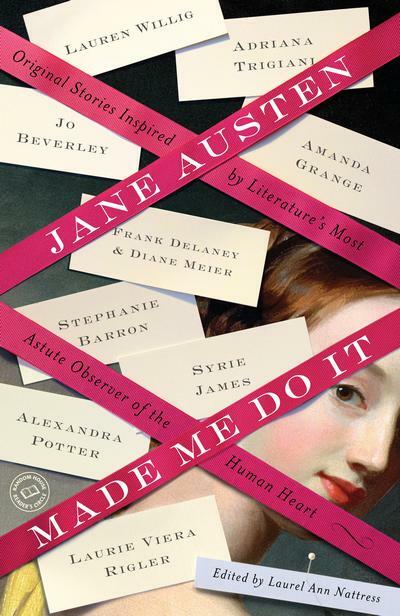 Waving my flag for the cover of my book Jane Austen Made Me Do It, and feeling incredibly fortunate and humbled by the reality that this is really happening after so many months of hard work by many. If you are so inclined, the book may be pre-ordered at many online booksellers including Amazon and Barnes & Noble. Now I need that shot of port please. Congrats on your success and hard work that you pour out over several months. I can’t wait to order and read it. I must say the cover is very beautiful. Congratulations! I’m happy to hear that your hard work has produced a great book with a beautiful cover! I look forward to reading this anthology soon and thank you for sharing this with us. Congratulations Laurel Ann! – a lovely cover – can’t wait to see it in displayed in a prime location in bookshops! Congratulations Laurel Ann! I love the cover! It is beautiful! The cover is gorgeous, Laurel. I am so pleased for you and proud of you. Congratulations! Cute cover! I’m sure the innards will be just as good. The cover design is beautiful — people leaving their “calling cards.” I love that creativity and look forward to reading the anthology. Congrats! The book and the related contest were inspired ideas. So exciting. Looking forward to reading it. Isn’t it thrilling to see your name on the cover of a book? One of life’s great moments. Congratulations. Congratulations! The coverart looks beautiful. I’m looking forward to reading it. Wonderful Laurel Ann! I would definitely buy it for the mention of your name and the Austenesque authors on it. Plus it has really eye catching cover design! I do judge a book by it cover sometimes… All round winner this one… can’t wait to get mine! Congratulations, Laurel Ann!! It’s just beautiful ;). Congratulation! It’s a beautiful cover! Gasp…what a perfect a book cover…I want one…and I will get one for sure…Congratulations, your baby looks beautiful and ready for the world. Well done! I look forward to reading your book with great anticipation! Great title and a very nice cover, congrats. Love it! I cannot wait to get to read it. Yippee! What a beautiful cover! Congratulations, Laurel Ann. Can’t wait to read it. amazing! This looks so good, what a fantastic project! I cant wait to dig into it :) many congrats! Congratulations! I love the cover, it’s gorgeous. Congratulations, Laurel Ann! Beautiful cover! Only one flaw – my name’s not on it yet. If I win, will you squeeze it in? My heart goes pitter-patter at the very thought! What a pretty cover. Congratulations, Laurel Ann! I’m so happy for you. ^__^ You definitely are the luckiest Janeite in the world! Congratulations. I book marked on Amazon can hardly wait to read it. October such along wait,though the months will fly by. The cover is really great! Many congratulations! It sounds wonderful. Looking forward to reading everyone’s contributions! I can’t wait to see it! I can’t wait to read it! Congratulations! Love the cover and can’t wait to read it. Brava! Your name stuck with a pin – cute touch. =) Can’t wait to get my hands on this one! How exciting! It’s great to see a Janeite’s dream come true. What a terrific line-up of contributors. I’m looking forward to reading their Jane Austen-inspired stories. Love it and can’t wait to read it. Congrats! Congratulations to you and your contributing authors! Oh, I love it — and can’t wait to read the lovely stories! What a fantastic cover! Kuddos to you on bringing it all together and making it happen! (And if you need any reviews… wink, wink). Looks great and I’m looking forward to reading the book when it becomes available! Thanks everyone for your kind words and wishes. I am so excited. Another 6 months though before the final reveal – all the great stories! So is my name (and that of the other B List authors) on the back?! LOVE the cover and what a fantastic array of authors! Can’t wait! I love Jane Austen! Looking forward to reading this! I look forward to grabbing a copy, when it’s out! Congratulations! I am pre ordering your book tonight! I love the cover and I can’t wait to read this! I realize I’m a month late to this party, but hooray! And congratulations!